A Brainerd family was abruptly awakened shortly after 2 a.m. on Saturday, when a pickup truck ran into their home. 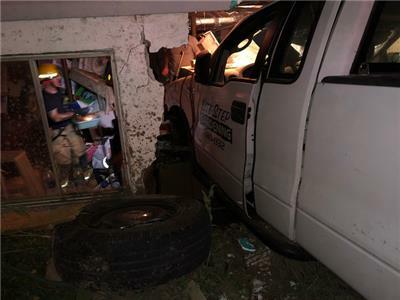 When Chattanooga firefighters arrived at 4113 Cherryton Drive, they confirmed that a large pickup truck had crashed into the base of the house. Fortunately, no one was injured. Battalion Chief David Thompson Jr. said firefighters with three squads and members of the department's Special Operations division worked to shore up the structure before the truck could be pulled out by a wrecker. The firefighters then covered up the hole, but advised the family of four, including two adults and two children, that they would need to stay elsewhere until more permanent repairs could be made to the rented house. Volunteers with the American Red Cross were called in to assist the family with an alternate place to stay for the night. The cause of the crash is being investigated by the Chattanooga Police Department, but Chief Thompson said patrol officers on the scene arrested the driver of the pickup and charged him with DUI.